Automation Rules add greater flexibility to Targetprocess by applying new triggered responses to changes within or outside of the application. If a comment is added to a Request - reopen the Request. If a GitHub pull request is merged - change the state of the related User Story (or any other entity). And many additional use cases. Automation Rules may also replace complex solutions made by the combination of Web Hooks and Metrics. However, the Automation Rules do not replace Metrics on their own. This feature covers many complex scenarios where the use of the Metrics is a current workaround. In further blog posts we will review some of the possible scenarios that can be covered with the Automation Rules in more detail and describe how they can be implemented using the feature. Internal Automation. These are scenarios where an Automation Rule reacts to an event in Targetprocess and makes changes also in Targetprocess. External Integrations. In these scenarios events trigger Automation Rules from an external system. query additional data from Targetprocess. 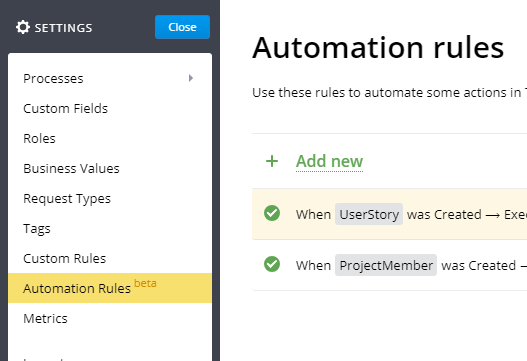 For External Integrations we added an incoming web hook source for Automation Rules. This source allows us to create a unique HTTP endpoint in Targetprocess that can be used for integrations with any service that can send HTTP requests with JSON content. With Automation Rules it's possible to link commits in version control to a related entity. There is also no need for configuring Targetprocess Git Plugin and SSH access for it anymore. This way similar integrations may be made for GitHub or any other service that have outgoing web hook functionality. At the moment rules are displayed as a plain list. We want to make it possible for users to organize created rules in a more comfortable way. Right now only errors are displayed in the diagnostics pop-up. We want to extend it to display information about successful rule executions - for example, the results of filtering.